TIP 1: Apply a drop topically to the wart a couple times a day until gone. TIP 2: Rub on sore joints to relieve symptoms of arthritis and pain from injuries. TIP 3: It seems that lots of people today complain that their brain seems sluggish. Since frankincense is high is sesquiterpenes, it crosses the blood brain barrier and therefore reduces these symptoms. Put a couple drops on your temples and in your hands. Cup hands over your nose and inhale deeply. TIP 4: Because frankincense promotes skin regeneration, it is an excellent choice for preventing or reducing wrinkles when applied topically. I personally use it neat to fade out or even eliminate sun spots on my face. TIP 5: To strengthen the immune system, apply daily to the bottoms of the feet or take internally in capsules. Never takes oils internally unless you are using Young Living Essential Oils. Many oils are adulterated even thought they are labeled 100% PURE. 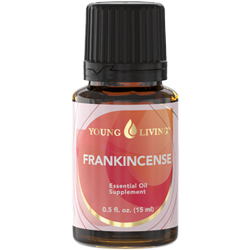 BONUS TIP: Frankincense has been successfully shown in studies to fight cancer! It's been used internally, placed in an empty capsule and swallowed and also injected directly into a cancerous tumor...both successfully destroying the tumor!